To be honest, my own knowledge of this franchise is almost completely limited to reading wiki pages and blog posts myself. I am about to spend an entire month reviewing things from a manga and anime I have neither read nor watched. It's been on my to-do list for years, I promise, but it seems like a lot of material to get into, and I've got a lot of other cartoons, comics, video games and movies on that to-do list. 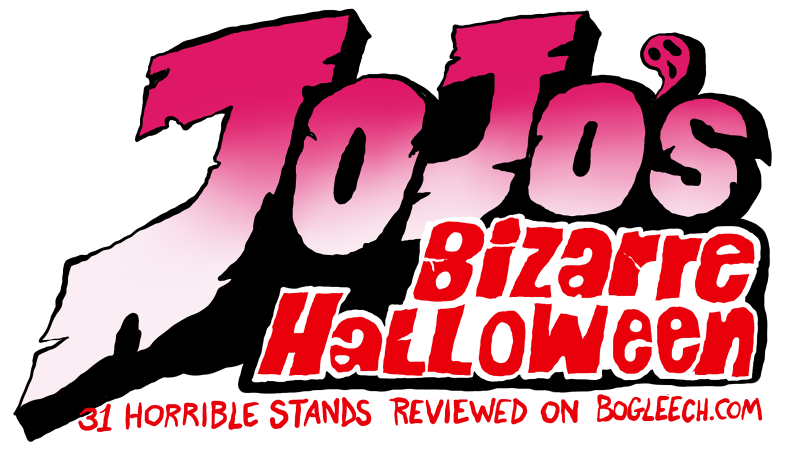 Regardless, it has been on and off as one of the hottest requests for me to review, and I made a promise, the unbreakable blood oath known as a tumblr post, that I would review Jojo stands as a 2017 Halloween feature. So do I break that promise, wait until I've actually experienced this series and review these things with the full context to appreciate them, or should I charge forward and offer opinions I am probably underqualified to offer as an outsider to a fandom? I think, as usual, that I'll go with "charge forward." I'm sure the main character, Jojo Bizarre at His Computer, would have wanted it that way. Without further ado, I've chosen Grateful Dead as our day one stand because it's appropriately spooky for the beginning of October and it's straightforward enough to introduce the concept of a stand to those of you who know even less about the Jojos, not that the concept can ever really be that straightforward. See, a stand is...uh...well...a stand is like, a thingy, that certain people can sort of conjure up from their mind. Everyone capable of using a stand has their own single, special, completely unique stand, and it can take basically any conceivable form. Most of them resemble living or mechanical entities, but some of them are just objects, phenomenon, places or abstract concepts, and whatever form they take, they can usually do something useful. So, this is Grateful Dead, and in fact, a whole lot of stands are named after famous bands, musicians or songs, especially from British and American music. Grateful Dead is the stand of a guy named Prosciutto, like the beef, but we're not here to talk about the characters, so don't sweat it if you don't know who Proscitutto is. 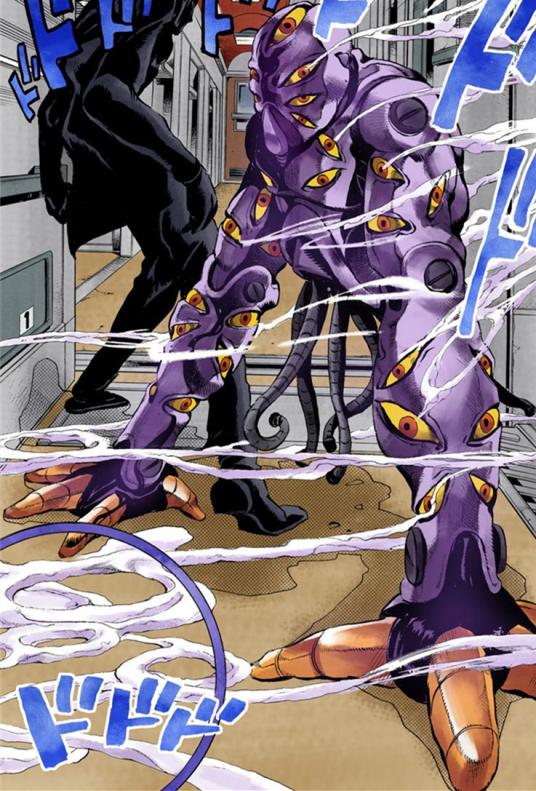 When Prosciutto activates the stand, it manifests this great looking quasihumanoid weirdo that walks on its huge, three-fingered hands and has a bunch of tentacular hoses dangling like guts where its legs ought to go. For good measure, it's covered almost everywhere with eyes and it doesn't have a mouth. In another series this would probably stand out as a fairly weird design, though in Jojo, its weirdness is fairly average, so I'd have to just give it a solid 3 out of 5 if I were giving these star ratings...which I am! 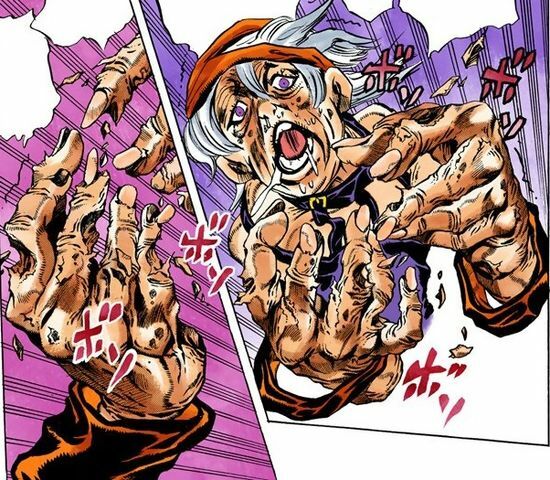 Stands are defined more by their power than their appearance, though, and Grateful Dead has a pretty grisly one: it can rapidly age anyone it chooses or even everyone at once within a wide area, until finally they just wither away and rot into nothing. The "aging" effects don't come with any "growth" effects, either; a baby will stay a baby, but it'll turn into a very wrinkly and tired baby before it falls apart. Because there's almost always one more oddball twist to every stand, the Grateful Dead's power works according to the victim's body heat. The warmer you are, the faster you age...but it's so susceptible to cold that you can fully reverse the effects if you just eat enough ice or take a very cold shower. Even with such a simple weakness, it's a pretty terrifying ability. In fact, I'm gonna say the countermeasure only makes it scarier. Some hope of survival, albeit one that isn't always immediately available, can really raise the stakes.